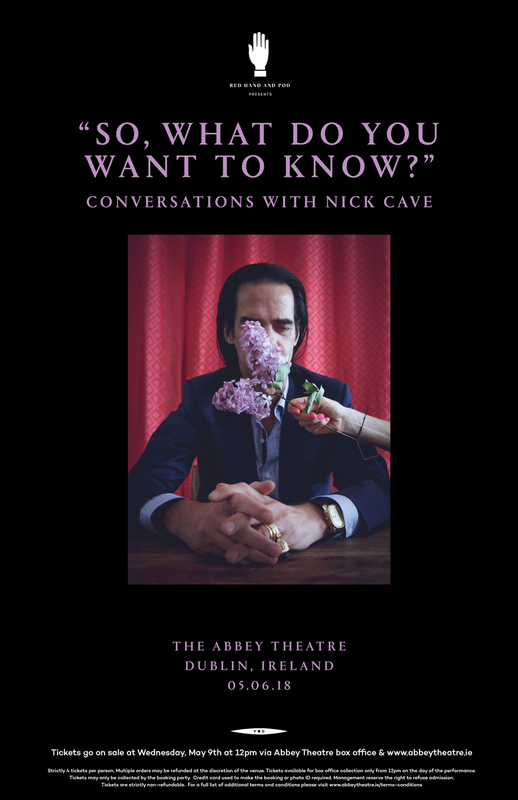 Nick Cave has announced an on-stage conversation event in Dublin, the day before the Nick Cave & The Bad Seeds’ sold out show at the Royal Hospital, Kilmainham on 6 June, their first Irish headline gig since 2008. Recently appearing for a short run of evenings of open discussion with audiences in the United States, the idea was inspired by Nick Cave & The Bad Seeds’ 2017 world tour and Cave’s evolving relationship with his audience. These shows became vast communal events and it is this relationship that he hopes to explore directly through this series of conversations. There will also be a Nick Cave season of films at Light House Cinema, Dublin and Pálás, Galway which highlights his contribution to modern cinema. From 1 June to 6 June, the cinema will screen films featuring Nick Cave’s screenplays, scores with fellow Bad Seed Warren Ellis and the incredibly insightful documentary collaborations – ‘One More Time With Feeling’ and ’20,000 Days On Earth’ – plus feature films ‘Lawless’, ‘The Proposition’, ‘The Assassination of Jesse James By The Coward Robert Ford’, ‘Wind River’ and ‘Hell Or High Water’. In London, the Curzon, Soho will also screen a short season of films including ‘Wings Of Desire’, ‘The Assassination of Jesse James By The Coward Robert Ford’ and ‘One More Time With Feeling’ from 22 May to 5 June, coinciding with Nick Cave & The Bad Seeds’ headline show as part of APE presents in Victoria Park on 3 June.